Scent is one of the most important part to brand yourself. That's why I think it's very important to choose which fragrance to use everyday. You might notice some of my favorites here: perfume. I always avoid fragrance which is dominated by oriental scent as it makes me feel nausea, I don't know why. 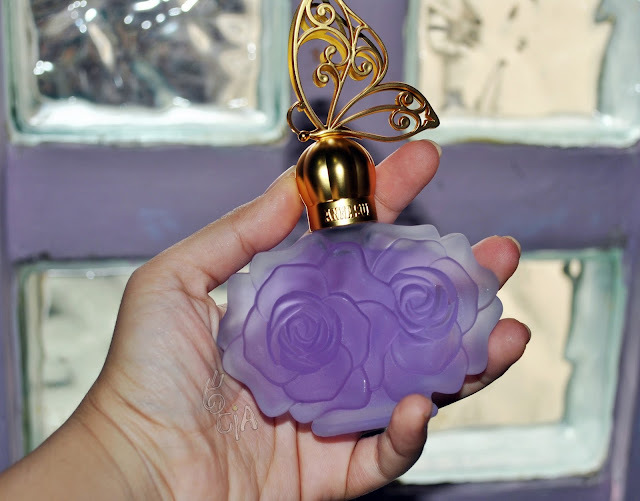 And I always fall in love with floral scent, which is described as romantic and feminine. My taste in fragrance always matches with Carnellin's. LOL, that's why we often recommend fragrance to each other. And here I got an Eau de Toilette (EDT) to try from Anna Sui. 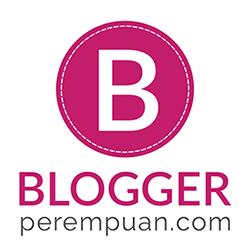 Yes, the legendary brand by legendary woman. 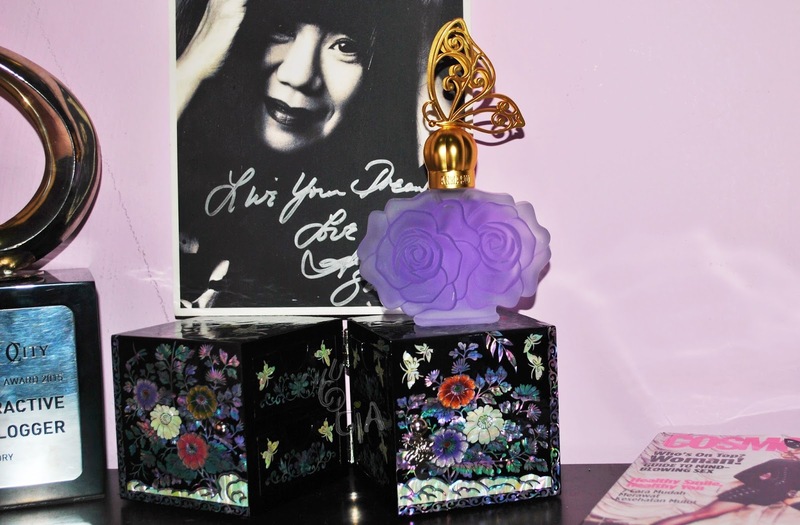 I always love Anna Sui's products but this is my first time to try the fragrance line. Anna Sui La Vie de Boheme is actually not a recently launch item, around 2 years ago, this fragrance was already available here in Indonesia. 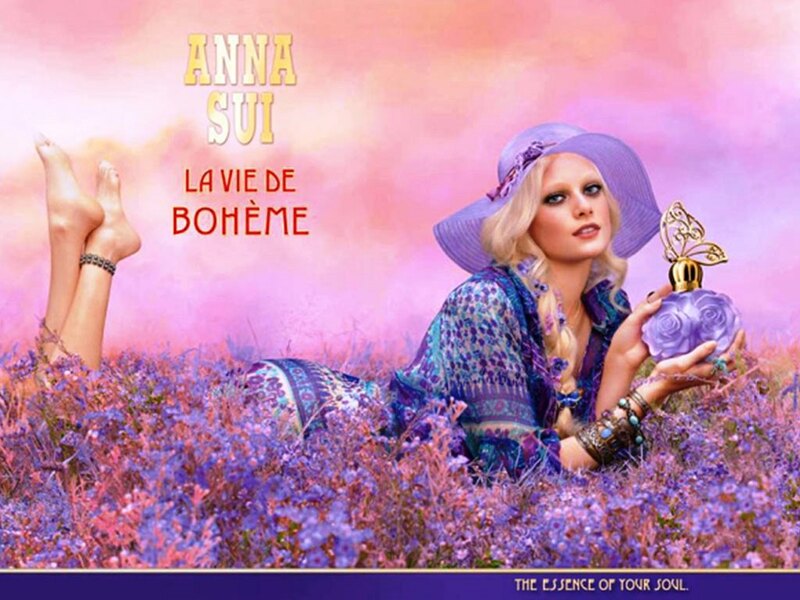 LA VIE DE BOHÈME by Anna Sui – Your life. Your passion. Your way. Deeply carved with roses all around, this elegant matte-finished flacon reveals a luminous lavender juice. The cap, finished in antique gold, bears Anna Sui's name on one side, and La Vie de Boheme on the other. The bud of the flower attracts a butterfly, symbol of freedom, alighting just for the day. A reminder to live every day, every dream, to the fullest. Inspired by the textures and prints of Anna Sui, the carton takes on a brocade effect, as intricate and elegant as the fabric itself. A nod to Art Nouveau, in its graceful, curvilinear design, it reflects the French/European Bohemian life at the end of the twentieth century, with its unconventional sense of creativity, freedom and beauty. The deep purple ground shimmers in matte satin, as embossed swirls in lighter lavender provide a rich counterpoint. Butterflies and roses in vibrant red bring energy to the design, a reference to Anna Sui's color palette and distinctive Bohemian artistry. The shield, worked in antique gold, gives off a soft, iridescent glow. 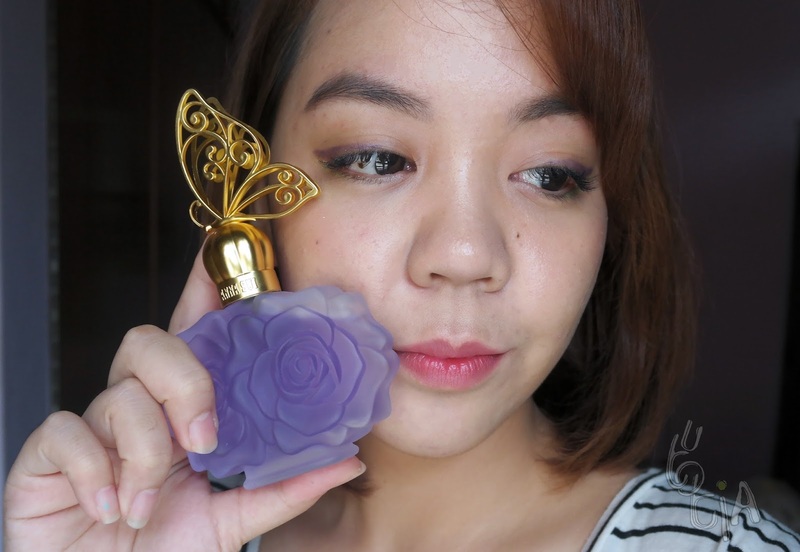 The iconic purple cloudy glass bottle in form of roses and butterfly on the lids, in golden and looks so beautiful. Yes, even the perfume itself comes in a collectible container. The La Vie de Boheme lifestyle always evolves, but the constant remains the same. And that is always a woman who is a bit defiant, a bit romantic, a bit artistic. In essence, it's truly the modern woman. Yes, the signature look may be mixed patterns, flowing dresses, boots, floppy hats, but every generation brings its own attitude to it, a unique expression of personal style. 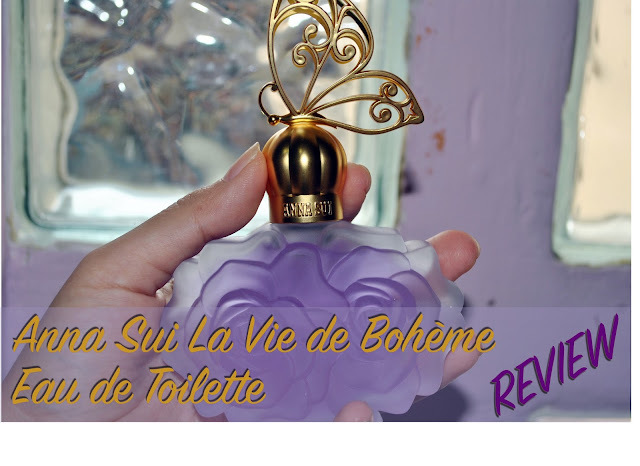 Capturing the energy and creativity of La Vie de Boheme, the fragrance opens with a burst of Turkish Rose and Sparkling Pear, kissed with rich red berries and Dragonfruit accord. As it develops, we get the sense of something surprising, something original, in its feminine, pink florals. A happy note of luck is added via peony notes, representing "good luck, feminine beauty, and friendship." The floral fruity nuances play against the woods, sheer musks, and a black vanilla and sandalwood accord to deliver a playful, ye t deeply mysterious, fragrance. Which is all to the Boho girl's liking. Friendship is all-important to her, freedom resounds in the juxtaposition of notes, and magic is in the air! I love the design!! The packaging really captures my attention. It is cute, beautiful, and elegant, all at the same time. The rose carves along with the doff glass adds more elegance. And it is perfect with the gold butterfly cap! For the scent, it is soft and dominated by Turkish Rose and Raspberry. And the longevity is quite good as it stays after 5 hours indoor and 3 hours outdoor. It's perfect for daily use as the scent is not heavy but strong enough to be smelled by people surrounding me. The comment from other people is all good, saying that it's sweet scent. Thank you Anna Sui Indonesia!